Due to some unfortunate planning on my part, I'll be out of town during this weekend's Vermont Brewers Festival. To make up for it, I recruited a friend and fellow beer lover, Jordan, to take a jaunt down Burlington's Pine Street and preview some of the new brews that will be on tap at the fest. 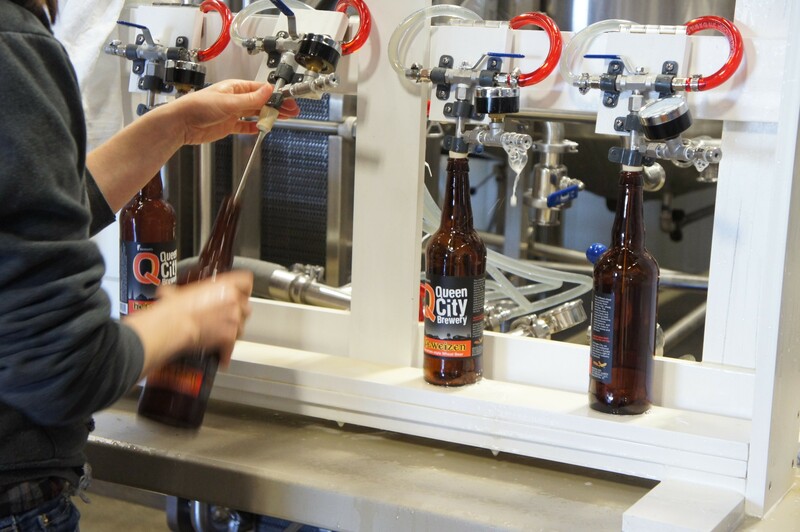 To guide our tasting tour, we caught up with some knowledgeable folks at Citizen Cider, Queen City Brewery and Zero Gravity Craft Brewery. They gave us the inside scoop (and copious samples) on some special brews to get pumped for this weekend. Our first stop was Citizen Cider. Yes, I’m aware that Citizen doesn’t normally do the beer thing. But for the second year in a row, it's teamed up with Zero Gravity to collaborate on a cider-beer for the brew fest called Citizen Zero. 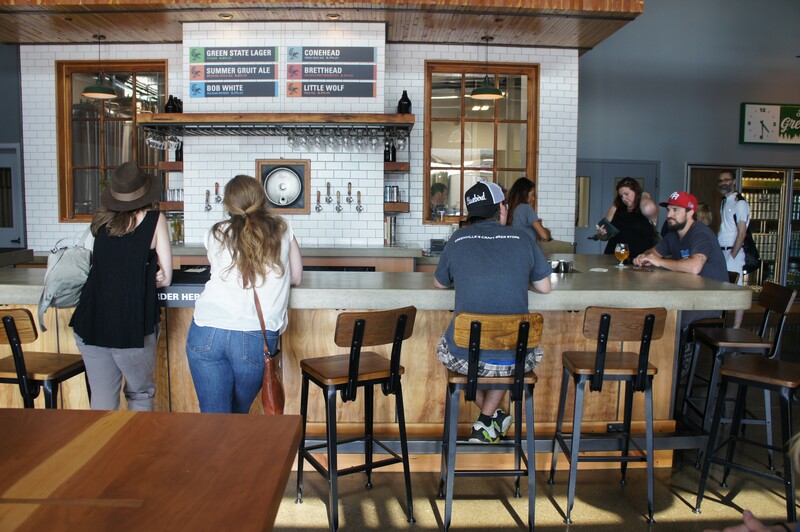 The Citizen Cider tasting area and bar is airy and spacious, with an outdoor patio and long, wooden, community-style tables inside. As we chatted up the bartender, interesting ourselves in the cider cocktail list, Citizen Cider cofounder Bryan Holmes appeared. Holmes, who manages the fermentation part of the business, is a UVM graduate with a PhD in chemistry. He greeted us and offered to give us a tour before we sat down to taste Citizen Zero. Leading us through some swinging doors just right of the bar (which I had assumed led to the kitchen), we entered a huge production warehouse — the place where every ounce of Citizen Cider is made. Seeing our awestruck expressions, Holmes told us that most people don’t realize what’s happening on the other side of the wall behind the bar. “I wish that people could come see this production,” he said, squeezing between two head-high cases of cans. The air had a pleasant sourness to it as we walked by some big fermentation tanks and racks of bourbon barrels. “We couldn’t find any barrels in Vermont this time, so these ones are from Kentucky,” said Holmes. He explained that the sweet cider he sources from Middlebury ages in the barrels for two months before it goes through the fermentation process. 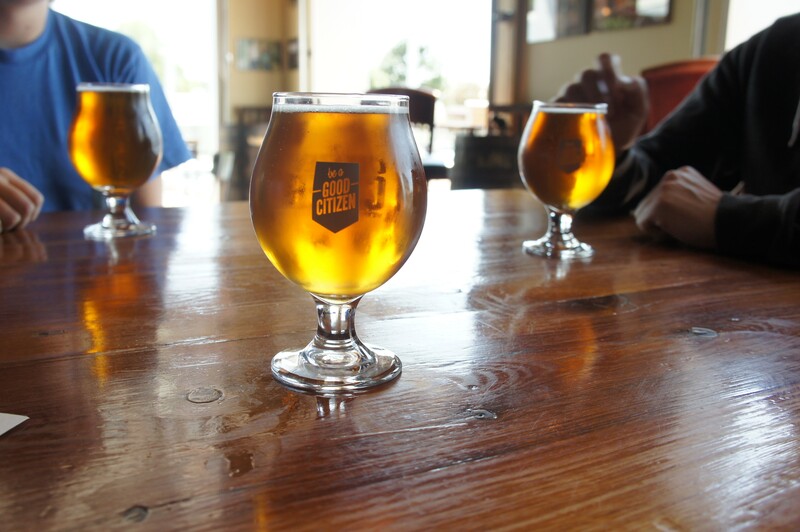 After the tour, we carried tulip glasses of Citizen Zero to take a seat with one of the masters behind the brew. Citizen Zero is a gruit ale-cider hybrid that’s made with malt, local sweet gale, mugwort and yarrow and fermented with English and Belgian yeasts. Holmes explained that gruit ales go way back to the Middle Ages. My glass shone golden in the afternoon sun. When I took my first sip, I really couldn’t decide: cider or beer? It was a perfect harmony of acidity, malt and sweetness. And it was exactly what I wanted for summer: something refreshing, drinkable and not too sweet. Holmes agreed. “It’s not muddled with flavor,” he said, adding that “there’s elegance to the simplicity of it.” But don't let Citizen Zero's easy sipping deceive you; its ABV is 7.6 percent. Hale told us that Queen City would be pouring seven beers at the brew fest, including its latest: an authentic steinbier. Despite being a new kid on the Pine Street block, Queen City is using old-school brew tactics. Just how old-school? To make the steinbier, Hale and his crew heat up rocks over a beechwood fire outside until they're white-hot, then drop them directly into the brewing tank. According to Hale, Queen City is one of only a few breweries in the world still making beer this way. Eager to try the brews, we sidled up to the bar and got a taste of the steinbier, plus a flight of a few other Queen City contestants for the brew fest. The steinbier was a trip, unlike anything I've had in my life. Though I wasn't expecting it, the unorthodox brewing process left a real, up-front smokiness to the flavor, with sweeter notes later on from the caramelization that took place when the hot rocks hit the beer. I'm not sure I could drink a pint of it, but I was certainly intrigued and finished off my sample with no problem. We moved on to three other drafts: City Beer, Landlady and the Yorkshire Porter. The lightest in color and taste, City Beer (Queen City's version of a Kölsch) drank like a pilsner with a bit more graininess. Landlady was more complex, letting off a floral aroma as I went in for the sip. The fruity, not overly hoppy flavor made it one of my favorites of the day. Finally, we moved to the Yorkshire Porter, which had the appearance of cold-brew coffee. I was originally intimidated by the dark color but was pleasantly surprised to find a smooth, relatively mild sip blended with chocolaty and "roasty" (as the bartender put it) flavor. For obvious reasons, we stuck to the sidewalk as we pedaled to our final destination. The bar at Zero Gravity Craft Brewery was just starting to fill up as we shook hands with co-owner Matt Wilson. Though the brew fest always draws a crowd, Wilson is a 10-year veteran of the event, so he's not too worked up about it. Zero Grav is pouring two new beers there this year: a Berliner Weisse aptly named Bernie Weisse and a Belgian golden ale called Cote de Champlain. Much to my dismay, neither one was on tap, so Wilson took us through a tasting of two of Zero Grav's flagship brews, which will also be featured at the festival. The first was Green State Lager, a golden-yellow pilsner that I could see myself sipping absentmindedly for hours in a lawn chair. Kyle Judd, a bartender at Zero Gravity, added to my ideas. "It's beer you could bring to the beach or on a hike," he said. The second sample, Conehead, which was comparable in hue but had a cloudiness that made it slightly opaque. Wilson explained that the haziness comes from dry-hopping. We drank as he told us that Conehead is a wheat IPA that shows off citrusy overtones and floral aromatics. "[IPA] is a style well-trodden in this area," he conceded. What makes Conehead different is how approachable it is compared with some of its super-bitter brethren. We joked that it's the only IPA you could give to your grandmother. If so, just call me Granny and set me up with a cold pour of Conehead. I could drink it all day long.